Activity directors live and work in a multicultural world with residents, clients, and staff from many different places on the globe. A travel program allows activity staff to connect with the memories of residents who lived in other countries, have friends or relatives overseas, or who enjoyed traveling in their youth. It can even help improve connections between staff who may have been born in a foreign land and the residents they serve. 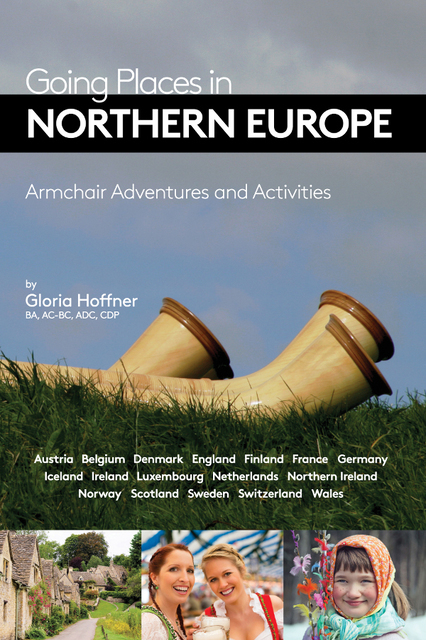 Each chapter in this book discusses one of 17 countries in Northern Europe. Each chapter covers the country's geography, language, national holidays, history, travel options, American roots, music and dance, food, and customs. Trivia questions for residents to answer are scattered throughout. The book includes suggestions for DVDs and online videos that show images and culture for each country. This book is designed to be used for a travel activity lasting one hour, one day, or one week, and spread over daily, weekly, monthly, or annual sessions. It can provide new ways to celebrate special events, such as holidays including St. Patrick's Day and Bastille Day. In addition, each chapter's Game section includes a fun and easy traditional game and a list of the cognitive and physical benefits of participation as outlined by the International Classification of Functioning, Disability, and Health (ICF) and by the guidelines of the International Classification of Health Interventions (ICHI). Gloria is an award-winning activity professional and a career journalist. In 2010, Science for Seniors was awarded first place in Best Practice division of the National Certification Council of Activity Professionals. The award recognized Science for Seniors as the most outstanding new activity program design among retirement, assisted living, personal care, long-term care, and adult day center facilities. Gloria is a contributing editor and monthly columnist for Creative Forecasting Magazine and a columnist on activity program ideas for about.com. She is also a frequent speaker in webinars for activity professionals and at national and statewide conventions for professionals in the healthcare, activity, and certified therapeutic recreation fields.